Mark Warburton insists Uwe Rosler can expect no favours if he attempts to sign any Brentford players for Wigan. Warburton, who was the sporting director at Griffin Park, has been installed as Bees boss after Rosler left to take over as Latics manager. "If we think the price is £2m then it's £2m, not £1m or £800,000 or some [money] now and some later - that's our price," Warburton told BBC London 94.9. "We've got to go about our business and do what's best for Brentford." He added: "That's not us being stubborn. We got the guys and looked after them and they're on three-year deals for a reason. "These players have come to the club and done really well. We've given them all the tools they need to perform, the support network and the shop window, so to speak, and they've been magnificent." Warburton is waiting to hear whether Rosler wants Brentford's assistant manager Alan Kernaghan - the German's former team-mate at Manchester City - and first team-coach Peter Farrell to join him at the DW Stadium. "I'm sure Uwe has gone up to Wigan and had a look at what he's inherited there and then he'll talk," he said. "I've said to Uwe: 'just be honest and talk to me and let everyone know'. Alan and Peter are really good guys and played a great role in what's happened at the club in the last two-and-a-half years. "I think it's important that we let the dust settle and then everyone talks and we can decide from there." 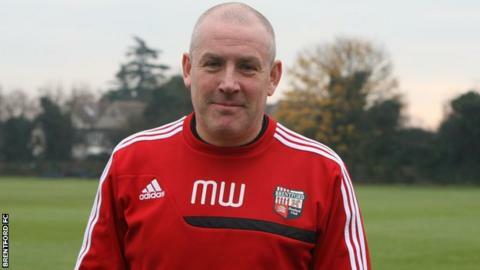 Warburton, who previously worked at Watford, joined Brentford in February 2011, initially as a coach. He became Brentford's sporting director - a role now taken by former Liverpool youth boss Frank McParland - after Rosler's arrival later that year. The club were almost promoted to the Championship last year, missing out to Doncaster on the final day of the regular season and then losing against Yeovil in the League One play-off final. After a difficult spell this term they have climbed to fourth in the table and are unbeaten in nine league matches. Club owner Matthew Benham therefore felt that appointing Warburton would offer continuity. Warburton added: "I believe in the players. We've got a fantastic squad here and Uwe and I both had real belief in what they could achieve. "Everything is in place. The old saying 'if it's not broke don't fix it' is very true and I've said the same to the players. "Yes, you've got to tweak it and put your fingerprint on it - anyone would do that in any role - and I hope the changes are beneficial and don't weaken us in any way."